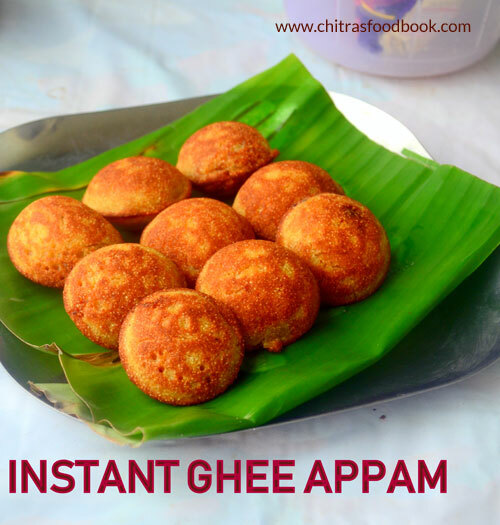 This is an instant version of Nei appam recipe (ghee appam). Traditionally nei appam is prepared using raw rice and jaggery. Usually I make sweet appam using wheat flour & banana in paniyaram pan. My MIL also makes an sweet paniyaram using raw rice which is our family favourite. But I wanted to try a quick sweet appam recipe without soaking rice and without banana. Yes this sweet appam is prepared without banana but still it comes out soft and spongy. This recipe uses rice flour, wheat flour, jaggery and rava/sooji. When I was going through my cook books, I got this recipe given by Mrs. Mallika badrinath. I tried the recipe as such but I was not happy with the result. It came out crispy & tasty but it looked dry & a bit hard . So I just added little cooking soda & it made a great change to the recipe. It came out super soft n fluffy with crispy outer layer. I was very happy & thought of blogging it for gokulashtami and Karthigai deepam festival.With superb flavor of ghee, it was awesome.If you are ghee conscious like me , use cooking oil or gingely oil for frying. It tasted good for both. I used paniyaram pan for shallow frying. U can also try deep frying it looks like chettinad vellai paniyaram with flower edges. 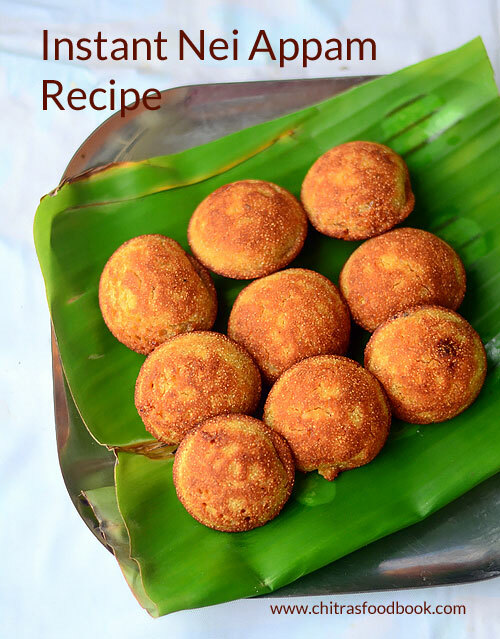 U can see that picture in step by step pictures..Friends , do try this easy, instant nei appam recipe for krishna jayanthi & Karthigai deepam and let me know your feedback. Do check out my traditional nei appam recipe with raw rice , sweet appam with banana & wheat flour. Add cooking soda 10 minutes before making appam. Mix well and let it sit. In a paniyaram pan , add 1 tsp of ghee in each hole & pour the batter. Cover cook for few minutes in medium flame. Flip it using a spoon or a small stick like thing. Cook again for few minutes till u get a nice golden brown color. If u want to deep fry , heat a pan with little oil & pour the batter using a small ladle. Deep fry one by one to get a nice shape.Splash the oil over the appam while it cooks to get a nice flower shape with frills in the sides. Remove & serve hot or cold. Consistency of batter is important..It should not be too thick or thin. U can also use cooking oil instead of ghee. I used ghee for my daughter & oil for ourselves.But add it generously.. Always cook in medium flame else it will be burnt..I felt the color of appam turned darker for ghee than oil. This appam stays soft for long time. It tastes crispy when hot & soft when cold.. If u want to skip baking soda, u have to add 1 ripen mashed banana OR you should mix the batter in the morning and make appam in the evening so that batter gets fermented. If u want the appam to be crispy, cook in low flame for long time. You can also try skipping soda. But you should eat the appam really hot otherwise it will look dry. wow yummy appams look so inviting :) lovely pictorials dear !! Appam looks too good.Happy to be your follower.